The GGBW started out in 1996 as a nostalgic event for riders of classic English roadster 3-speed bicycles, and did pretty well for years, even getting some serious press from the Philadelphia Inquirer HERE. For 2015, we’re opening things up a bit and inviting owners of new machines to attend: That means Brompton folders, Moulton Spaceframes, and of course, the shiny new Pashley roadsters that look as if they rolled straight out of a 1930s factory. If you own an older bicycle, an F-frame Moulton, say, or a Raleigh Supercourse, Clubman or Tourist, we’d like to see you. Ditto if you’re pedaling a Bickerton, Lenton Sports or BSA. If it’s made in the UK and it pedals, the British Bike Weekend will offer you a ride, a cup of tea and something stronger during the Great British Bike & Pub Crawl which starts Saturday afternoon. 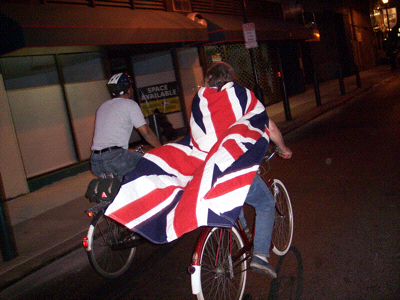 On Saturday morning, we’ll pay visits by bicycle to three Philadelphia shops with strong UK connections: Via Bicycle, Firth & Wilson, and Trophy Bikes. All events start/finish close to center city Philadelphia. Please visit/like/share our Facebook Event page for a full schedule and to RSVP! Oh, and please note that workshops are open to all, but for our rides, we ask that you be aboard an English-made bicycle; thanks for your cooperation in that respect.